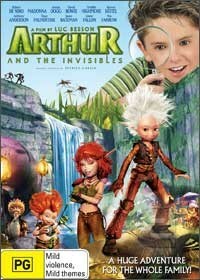 Arthur and the Invisibles has finally arrived on DVD which follows the adventures of a boy who stumbles upon another world. This entertaining children's story was originally released in France as Arthur et les Minimoys and and features state of the art computer graphics and an entertaining story. The story revolves around Arthur (Freddie Highmore), a 10-year old boy who lives on a farm with grandmother (Mia Farrow) and wishes to be someplace else. Yearning for his parents (Penny Balfour and Doug Rand), Arthur soon becomes enthralled with the stories of his grandfather, Archibald (Ron Crawford) who is lost in Africa. Alone with grandmother on his birthday, Arthur decides to help her out by following a series of clues left behind by Archibald that apparently lead to a buried treasure. His search involves meeting a set of Massai warriors who assist Arthur by shrinking him to the size of the Minimoys that live under the lawn of his grandparents house. While searching for his grandfather, Arthur becomes enamored by the princess of the Minimoys (Madaonna) and agrees to assist them from the malevolent Maltazard (David Bowie) who threatens to enslave the Minimoys. This outrageous tale is rather good children's movie and will really immerse you into this story once the title goes from the "live-action" to CGI, it's definitely an exciting journey from start to finish. Presented in an aspect ratio of 16:9 widescreen with Dolby Digital 5.1, this is one movie that is oozing with cinema quality. Recommended!